image: Alejandro Frid diving at the Halkett Bioherm in Howe Sound. Photo by Adam Taylor. October 27, 2009. A clear and cool autumn day in Howe Sound, a deep-water fjord right on the edge of Vancouver, in the company of marine biologists Jeff Marliave and Donna Gibbs. I was working with the Vancouver Aquarium Marine Science Centre and – lucky us – it was another day at the job. You see, Jeff had become fascinated with bioherms: reefs of glass sponges living on layers of dead sponges. This is ancient stuff, dating back to the Jurassic period, more than 145 million years ago. Most bioherms are very deep, inaccessible to divers. But—much to our excitement – some unusually shallow ones had been discovered recently in Howe Sound. The plan was for Donna and me to dive a bioherm off southeast Gambier Island and document its fish and invertebrate life. I had been working with Donna and Jeff for a year and half, making hundreds of dives to study lingcod and rockfish. For the most part, my analyses were showing an absence of large fish, reflecting a history of overfishing. I had also immersed myself in the scientific literature on climate change and ocean acidification, two major stressors which, combined with overfishing, are altering the world’s seas irrevocably. Back then my daughter, Twyla Bella, was five and a half. Watching her grow up, I could not stop thinking about how the ocean supports most life on Earth, including us, yet is suffering severe collateral damage from our carbon-intensive economy. That is the kind of understanding that, if you are not careful, gives you license to give up. Had you burrowed yourself into my psyche that day, you would have seen a sort of ping-pong match between my nihilistic demons and that struggling part of me that wanted to gift Twyla Bella with genuine optimism. We approached the site. Jeff piloted the dive skiff and, after slowing down and turning on the GPS and depth sounder, launched into classic Jeff Marliave theatrics. That is, he hollered, at the top of his lungs, our depth relative to the target: “60 metres, 80 metres, 50 metres…too deep!” And so forth, with plenty of colourful language interjected here and there, until he nailed the spot and yelled at me to drop overboard the weighted line which, once suspended from a surface float, would guide our long descent through the water column. Shortly afterwards, the float stood straight up, immobile. No current at all. Unusual in this often-tumultuous part of the sound, yet exactly what we needed for this dive. After donning scuba gear, Donna and I rolled backwards into the water. While still at the surface, I looked down towards the bottom and almost lost my regulator as my jaw dropped open. Thirty-three metres below—past the far reach of streaming sun rays—I could see the white expanse of the bioherm. Staring through that extraordinarily clear water, I felt as if I was inside an ethereal womb, filled with certainty that, no matter the damage wrought by overfishing and climate change, the moment was as real as it gets. So we plummeted. Straight towards the bottom, until we broke our freefall with short blasts of air into our dry suits, mere centimetres above the convoluted, maze-like towers of glass sponges. In the quiet buzz of controlled adrenalin, we set to work. Donna documenting tiny shrimps, some with melodic names like Eualus, Heptacarpus, Lebbeus. Me, I just counted fish. Everywhere around me were quillback rockfish, my spiny friends whose intense blacks and yellows beckoned me to go deeper and closer; I love the fact that they can live almost a century, if given a break from fishing. Puget Sound Rockfish, orange-red, tiny, hiding in sponge cavities. Lingcod, the largest predatory fish on these reefs. Throughout the dive, a harbour seal swam about twenty metres to the side of us, perhaps feeding. And it went on and on. Inevitably, as nitrogen built in our blood and the air pressure in our tanks dropped, we began to rise. The trip up was slow and, with no current to sweep us sideways, we could control our movements without having to hang on to the guide line or kick our fins. We floated up in peaceful space, lifted passively by the air inside our dry suits which we released, in small bursts through a valve, as it expanded under the lower water pressure of shallower depths. The bubbles that we exhaled were the only sound, yet the speechless conversation was very animated. 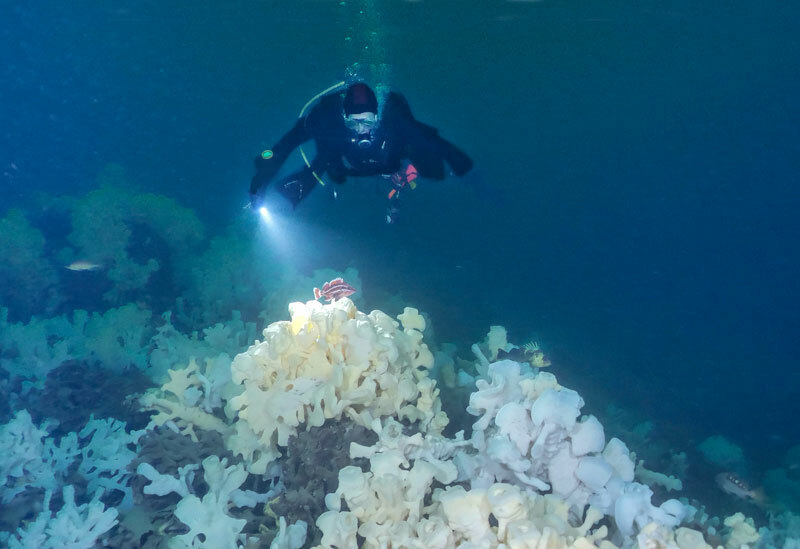 Staring down, we regained a panoramic view of the white expanse of glass sponges and the dark shapes of hovering rockfish. Ten metres from the surface we entered a thick aggregation of Nanomia bijuga: tailed jellies the length of my forearm and shaped like snakes, their star-like organs held inside translucent bodies. A living constellation. All of this a mere twenty-three kilometres from downtown in Western Canada’s largest city. All of this amidst acidifying oceans and rising concentrations of atmospheric carbon dioxide. Bioherm. Rockfish. Nanomia. Who would have believed that they were still here? Bioherm. Rockfish. Nanomia. What do they have to say about the world that will be handed down to my daughter’s generation? And it was then, still struggling for an answer yet empowered by the question, that I broke the surface. I write these words during a clear winter night, not long after our celebratory solstice gathering around a bonfire. A big moon shines in through my window. Her glow has always been special to us, one of the elements that define our relationship. Solstice celebrates the long nights of starlight and moonbeams, the mystery of darkness and the living things that thrive in it, from the great horned owls we used to hear when we lived in the Yukon to the phosphorescent, tiny algae that ignite the ocean night. That is a good darkness. Essential. And so is the other side of solstice: the return of longer days and all the growth, diversity and hope they bring. I cannot contain my impulse to write down these thoughts for you. You are only three years old, yet I want you to know that I have been part of a collective effort to hand down to your generation a world worth living in. That does not mean that I am doing enough. Certainly not nearly as much as many others. But it does mean that I care and try. Those who do more give me a sense of identity when I need it most. Their work is a trigger for these words, which I hope you will read some day. I began worrying about the impact of people on each other and the rest of the living world at a very young age, long before you were born or I had even met Gail, my fabulous wife (lucky me!) and your mother. I first wrote on these themes for my high school newspaper (I hope to find these pieces for you). Your birth, however, changed me in two ways. First, it intensified my awareness of human-caused impacts on the planet and my desire to do something about it. More importantly, whether I accepted it intellectually or not, every spiritual and emotional aspect of my being decided to believe in a long-term living planet. To believe otherwise would be unfair to you, as prophecies are often self-fulfilling. So I tried to jettison my gigantic cynicism, at least most of it most of the time, and focused on the positive and doable. As part of that commitment, I began this scrapbook account of what I was up to before you were born and as you were growing up. It will be years before you are old enough to read and understand these words. Meanwhile, there is a fire of resistance against the deterioration of the biosphere that is burning brighter and brighter. This is also a fire of renewal, in which we humans may actually fulfill our potential to be a wise species that practices coexistence. Of course, I expect huge losses to occur. By the time you understand these words, whatever peace and coexistence we may have achieved will be fragile, subject to catastrophic upheavals and in need of further acts of resistance and renewal. What matters most is to not kill the future altogether. Thanks to you and others who inspire me, I believe that is possible. Author and ecologist Alejandro Frid is the Science Coordinator at the Central Coast Indigenous Resource Alliance and an assistant professor at the School of Environmental Studies, University of Victoria. 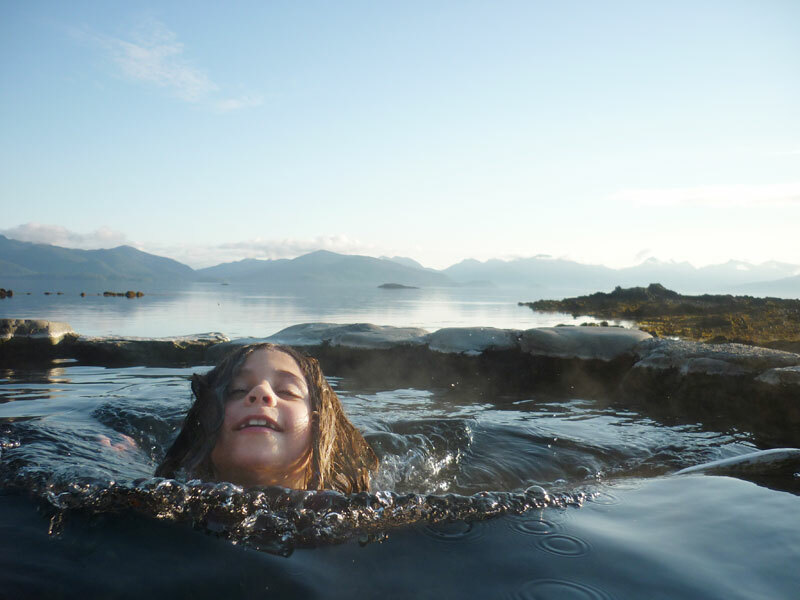 Breaking the Surface and Letter to the Future excerpted from A World for My Daughter, an Ecologist’s Search for Optimism by Alejandro Frid, Caitlin Press (2015).